Author: Klaus Beyer. Series edited by: Gudrun Miehe, Brigitte Reineke, Manfred von Roncador. 8 pp. Roman, 223 pp. 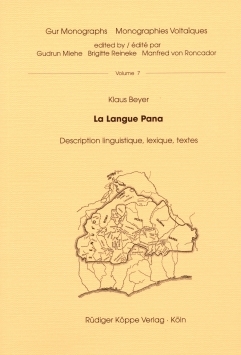 This work comprises a detailed phonological, morphological, and syntactic description of the nearly unknown and endangered Pana, a northern Gurunsi language. Pana is spoken in Northwest Burkina Faso and the bordering areas of the Republic of Mali along the river Sourou by approximately 5,000 people. The present synchronic analysis of Pana is complemented by a historical-comparative excursion. Here the nominal class system which is actually reduced is reconstructed by dint of internal and external evidence. A lexical appendix – Pana-French and French-Pana – and three short Pana stories with interlinear and free French translations conclude the book. Pana is very interesting for language contact research because it is isolated as a Gurunsi language in an area dominated by Mande languages. A complementary work about the resulting contact phenomena in Pana is in preparation.